Composed of stunning photographs by up-and-coming talents Chris Tierney and Peter Fedrizzi, the calendars cover all aspects of cycling in Galway and the cyclists who make up all facets of life in Galway city and county. There are cycling teachers, cycling college lecturers, and the smiling children at Galway’s annual Bike Week Treasure Hunt. The amazing success of the Green Schools Travel program is epitomised in a photo of the children of Eagles Nest national school in Renvyle tearing down a local beach on their bikes. There are stories of how cycling helped people overcome adversity, such as Liam Cullinane, who was able to regain his independence after a severe bout of meningitis, and local hurling star Dave Collins, who cycled back to fitness after a catastrophic injury on the pitch. There is a cycling Garda and a bus driver who cycles to work every day. 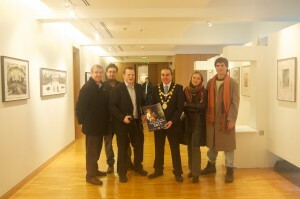 The arts are featured, with Páraic Breathnach relating the story of his first bike, and Natalia Surina, a harper whose bike is her first choice in transport. The sport of cycling is celebrated with local champion Sadhbh Baxter of the West Coast Wheelers. The grass roots of cycling activism in Galway is also captured in the monthly Critical Mass bike rides, with balloon-festooned cyclists flying the flag for fun (and politics with a small p)! The calendars are just one aspect of a larger €28,000 Image of Cycling in Galway project co-ordinated by Justyna Kocjan on behalf of the Galway Cycling Campaign. As part of the project, a unified brand and logo for cycling in Galway has been developed by graphic designers Simon Fleming and Alexa Mottram under the catchphrase “Treibheanna ar Rothair” (“Tribes on Bikes”) and will be promoted via various promotional items across the city and county. The calendars are freely available in bike shops, outdoors shops, Green Schools, Charlie Byrne’s bookshop, Galway City Council, Galway Transportation Unit, HSE Health Promotion, NUIG, and GMIT, and can also be requested by emailing info@galwaycycling.org. 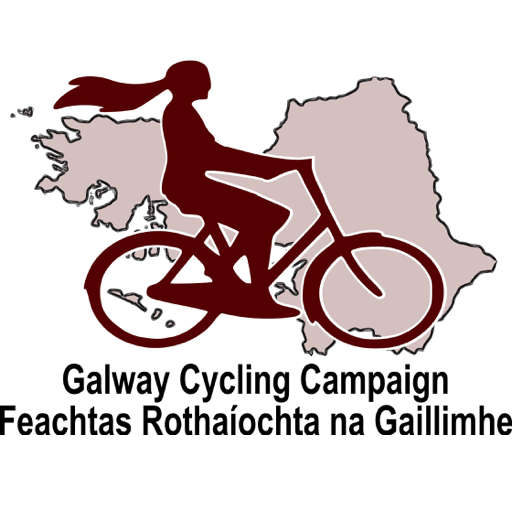 Formed after a large public meeting in 1998, the Galway Cycling Campaign works to promote cycling as a healthy, convenient and accessible form of transport in Galway city and county. The €28,000-funded “Image of Cycling in Galway” is just one of a number of projects the Cycling Campaign is involved with to promote Galway as Ireland’s Cycling City. Working with the Chamber of Commerce, the campaign has also obtained Smarter Travel projects funding of €400,000 for bike parking at city businesses and €8,000 to train and support Workplace Cycle Champions at offices and factories. Other activities include the annual Bicycle Treasure hunt for the city’s younger cyclists and the Faster by Bike in Galway project (co-funded by the City Council and the HSE), which puts signs up on traffic lights with safety messages, indicating typical cycling times to key destinations. The Cycling Campaign also produces cycle skills leaflets that are now being reproduced in Waterford and Dublin. The Galway Cycling Campaign have written to City Council Director of Services, Ciaran Hayes, seeking clarification on the qualifications of the consultants assigned to Galway City and Environs Walking and Cycling Strategy (AECOM). The Campaigners say that they have been unable to establish that the consultants have taken an approved cycling skills course or have formal training that would allow them to assess roads used by cyclists. The Irish Government’s National Cycle Policy Framework states: “We will also stipulate that that all local authority roads engineers and any engineer wishing to tender for government road contracts should be required to have taken an approved cycling skills course”. The stated policy of the National Cycling Lobby Group, Cyclist.ie also specifies that the completion of an approved cycling skills course is a standard requirement for all consultants undertaking such work. The Cycling Campaign have requested documentary evidence showing that the consultants (AECOM) have taken such a course. Shane Foran speaking for the campaign added “In the UK and Ireland , the only accredited cycling skills course dealing with the full range of on-road traffic skills is the UK National Standard for Cycle Training. The Green Schools Travel staff currently working with 400 schools, including schools in Galway, have been trained as UK National Standard instructors” The Cycle Campaign states that current best practice for drafting viable cycling strategies requires consultants who are able to audit the existing roads, and any proposed new designs, with reference to “design cyclists” who come under the different ability levels defined under the National Standard curriculum. The cyclists say that it is totally unacceptable that the City Council should apparently be seeking to develop a cycling strategy in isolation from the advice that child and adult cyclists are being given with regard to using the roads. The cyclists say the issue of consultants being able to show that they have necessary training is non-negotiable issue, because having untrained and unassessed consultants advising on cycling measures is viewed as equivalent to employing general traffic engineers who don’t possess driving licences or any independent verification of driving competence.